After the initial sale, manufacturers and distributors have traditionally struggled with driving further cost savings. Warranties, replacements and parts fulfillment costs were part of the norm and often thought of as the “cost of doing business,” explains PwC. However, more manufacturers are finding post-sale operations involved in reverse logistics — the essence of the service supply chain — can be a key driver of competitive advantage. Thus, more manufacturers need to understand these concepts to achieve profits and growth realization. Why Is the Service Supply Chain Driving Competitive Advantage? Costs of repair or replacement versus new order fulfillment. These driving forces all go back to ensuring consumers have the products they need at the right place, at the right time and at the right cost. Therefore, companies that take advantage of outsourcing service supply chain processes to a third-party expert, such as Flash Global, can leverage further benefits of warranty protections, authentic OEM parts and reducing costs along the way. In other words, the overall “cost of doing business” can be reduced without sacrificing product quality or attention to detail. How Does Outsourcing the Service Supply Chain Benefit Competitive Advantage? PwC’s 2014 publication, “Service Supply Chain as a Source of Competitive Advantage,” identified three primary “sources of leverage” within reverse logistics that enhance competitive advantage. Consequently, these sources of leverage give rise to the following aspects of competitive advantage. Companies are limited to a careful collaboration between working capital and investment into new technologies. Unfortunately, these investmen ts can be limited when an organization is in the stages of growth or contraction. Thus, companies must turn to other cost-effective sources of operation expansion, such as outsourcing the service supply chain to another entity, reasserts Lisa Harrington of Inbound Logistics. For example, 31 percent of customer entitlement requests, such as filing a claim for a product under warranty, are achieved through self-service means. In other words, customers fill out the necessary return paperwork online. Similarly, social media is becoming a force in achieving self-service requests. However, the maintenance of these channels, which must still include traditional call centers and in-person requests, a materialization of omnichannel customer service, may require additional resources and personnel to manage. Rather than incurring additional costs, companies can outsource these processes to a single entity that has the technology and resources readily available at a lower cost than in-house operations. The level of engagement between service supply chain partners is another aspect of competitive advantage. Traditional competitive advantage resulted in isolationism and failure to always rise above customer expectations. However, collaboration has become the new means of reducing costs to the consumer without relinquishing proprietary information. In other words, the level of engagement and protection of proprietary information is increased when an unbiased third party is in control of such operations. Rather than devoting time and energy to meeting consumers’ demands across one company, outsourcing leverages the organizations’ “business ties” to create a more holistic, accurate, fast and cost-effective means of operating. In the modern world, end-to-end performance and visibility are crucial aspects of successful supply chain management. In the service supply chain, failure to adhere to environmental or privacy regulations during the repurposing or recycling of technology, such as computer hard drives, can lead to infractions against domestic and international trade compliance requirements. Ultimately, outsourced service supply chain operations inherently lead to increased visibility. However, it can also improve overall performance by eliminating organization silos and isolationism from the equation. Therefore, all companies can work together more efficiently without knowingly or unknowingly violating compliance statutes. Today’s definition of competitive advantage is not what you may have been taught in school. It involves collaboration, working to reduce costs after the customer leaves and ensuring all products and services adhere to official regulations. For example, green initiatives may not be required, but public perception via social media can define your organization’s ability to maintain competitive advantage. Essentially, the service supply chain is the modern source of driving greater growth and competitive advantage in your organization, and you should consider the benefits of outsourcing its operations before your competitors do. 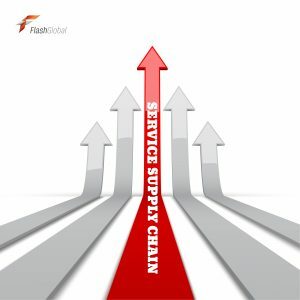 To learn more about how Flash Global can help customers drive value and gain a competitive advantage through effective, cost-efficient service supply chain solutions, contact us today.